PREEN MAC COSMETICS AND CHARLOTTE RONSON « LUXETIPS! | Every Woman Deserves To Live The Luxe Life! I hope you are having an awesome day! It is rainy and coooold in NYC! 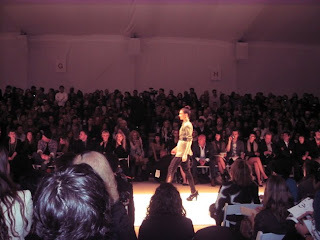 But that does not stop Mercedez-Benz New York Fashion Week! Today I had the opportunity to cover make-up and hair for the Preen Fashion Show. Preen is a British label that was launched in 1996. The clothes are edgy, punk rockish, and futuristic. Keeping this in mind, the lead MAC Make-up Artist, James Kaliardos, created a look that was slightly futuristic with a masculine/feminine vibe. As Mr. Kaliardos stated, “the girls look masculine but are still super beautiful and feminine. The look was very light but futuristic. The MAC artist started with healthy looking skin. MAC Moisture Care Concealer. This product was applied only where needed. Full coverage foundation was not used. MAC Pro Cheek Color in Sculpt was used to contour the cheeks and on the eye lids. Lashes were curled only without Mascara. MAC Pro Pigment in Platinum was used in the inner corner of the eye. MAC lip conditioner was used on the lips. MAC White Eye Pencil, Fascination, was used in the center of the lips as a highlighter. Here is the look: simplistic, light, and futuristic. The hair was done by Bumble and Bumble stylists. The look was boyish/girlie, which was a more short cut styled with Bumble and Bumble Surf Spray. The stylists used a hair dryer and their hands to style this look. There is also a slight pouff in the front for a sleek but manageable look. 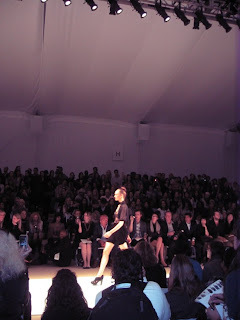 I also went to the Charlotte Ronson show. Charlotte Ronson is a young hip line that is all the rage with young starlets! Nikki Hilton and Keri Hilson are huge fans! They were in the front row! 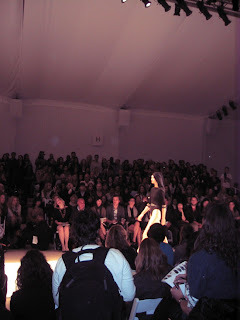 The clothes were very rock and roll yet feminine and ultra modern. Here are a few pics! My favorite outfit. Black sleek swimsuit with a hood! Hot! Here is a video of the show submitted by makeup artist extraordinaire, Victoria Stiles. Okay Divas. I am running off to the next show. 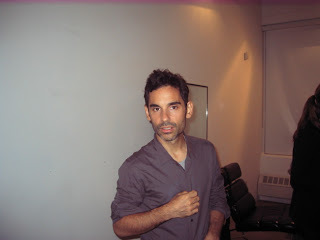 More New York Fashion Week Hotness to come!